Well first off - what is a lifestyle, in basic terms it specifies how many instances will be available at any one time from the container - so at the one extreme we have components with a transient lifestyle, where any requests from those components will return new instances - and at the opposite end of the spectrum we have singleton components, where there is only one instance for the whole container - there are other types of lifestyle, but we'll leave those for another post. So first off - castle is all about convention over configuration, and by convention a component in the container is a singleton... so in this example we'll look into ways in which you can switch a components lifestyle to being transient. That doesn't seem right - our service is retaining a count, so we want a fresh instance of the class every time we request it - which means we should shift our component to the "transient" lifestyle - lets have a go at doing it with configuration, by adding the lifestyle attribute to the components definition. There are other lifestyles available to use - it's worth having a look through the castle wiki for more details... and we'll probably cover them in another post. 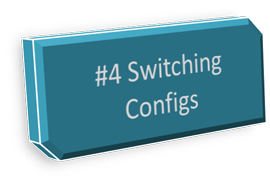 In the next part we will cover switching out implementations of components themselves. So in this part we're going to look at configuration parameters - parameters let you consolidate or seperate individual configuration parameters away from the components themselves, in this case we are going to create 2 config files, one for parameters to use in the live system, and the other for parameters in the debug system. Notice how the components configuration value has a hash (#) and some braces surrounding the word "configName" - that causes castle to look up the value of the property by the same name (which we declared in the property config file). The application code is the same as part 4. A common approach when working with developers who may need different configurations is to a file called say properties.config that contains all the configuration values that need to change between machines, and to not check that into source control... Be sure to also keep a "master" copy of the properties, say "master-properties.config" which provides a template for developers to create their own configuration (it's not a bad place to stick the instructions for doing this as well). So, we have all this stuff in a configuration file... but what if we have two sets of configuration we want to swap between - perhaps one for test and one for live... well here's one way of doing it with the Windsor container. There are other ways to achieve the same thing, but this is often the easiest to understand... also take careful note of that uri attribute on the include element... you don't just have to use the file:// scheme - you can include resources (embedded in your assemblies) or extend the resource subsystem with additional support for your own types of resources - but before you do, be sure to have a look at the list of out of the box possibilities here. One question that was asked about during Architecture Camp was how container configuration could be synchronized between multiple servers, and includes provide one possibility, because you can place your shared configuration on a network share, or implement your own special resource type, that could for instance get the configuration from a webservice. Next time we'll look at introducing configuration parameters, which is another way to deal with the problems of having to switch between configs at runtime - and can make your configuration easier to read and maintain too. Now at this point you might be wondering just how the strings are getting converted into strongly typed values for the last 3 parts - and to be honest, you won't need to know most of time, just do what "seems" right and it'll probably work... but when it doesn't, check out the castle projects wiki topic on component parameters, configuration and type converters. xmas is only for management! new year, you haven't done all the work for last year! 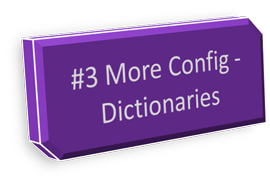 See you for part 3 where we do dictionary configurations.